We’re online 24/7. Click the Live Chat prompts and speak to one of our Course and Career Advisors. 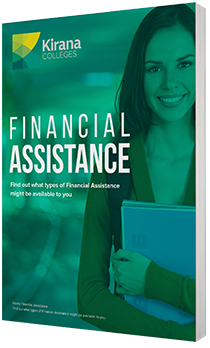 To find out what types of financial assistance might be available to you, please complete the form below. Your Career, Your Way. A Kirana College's qualification gets you started! ONE CLICK AND YOU'VE STARTED! You can help improve someone’s quality of life with a CHC33015 Certificate III in Individual Support (Disability). People with disabilities and the elderly are often most in need of our help. With a Certificate III in Individual Support (Disability) you can improve or change their lives by providing person-centred support. If you have a passion for helping others, this course can bring you to a rewarding and fulfilling career. This course is delivered by one of the following Kirana Colleges Registered Training Organisations; Kirana Training RTO ID 52247, Learning Lab Pty LTD RTO ID 91341, Insight Training Group Australia RTO ID 32142 and Access Training Institute Pty Ltd RTO ID 91498. To achieve a CHC33015 Certificate III in Individual Support (Disability) a total of 13 units of competency must be completed (seven core units and six elective units). Anyone can apply. No prerequisites necessary. It’s preferred that students have obtained a minimum of a School Certificate or equivalent. Students will be required to provide a current National Police Certificate prior to commencing work placement. Kirana’s student selection process is designed to ensure that you are enrolled in the qualification that best meets your needs. Students not meeting these requirements will be directed to more suitable qualifications or skill development programs. This qualification can be funded to eligible students through ACT Skilled Capital, a subsidised training program offered by the ACT Government. Skilled Capital funding is available through Kirana Colleges Registered Training Organisation: Kirana Training Pty Ltd RTO ID 52247. Let one of our Course and Career Advisors help work out the best funding model based on your eligibility. "My learning experience has given me so much more knowledge and confidence in something that I am totally passionate about…"
"The teaching, learning style was very well suited to myself and fellow students…"
"Would recommend this course to anybody working in Aged Care." Reach Your Potential.Kirana Colleges is a subsidiary brand of Kirana Education, delivering education and training nationally. We deliver a growing scope of nationally recognised Certificate, Diploma and Advanced Diploma level qualifications through Kirana Education's Registered Training Organisations Kirana Training Pty Ltd RTO ID 52247, Access Training Institute Pty Ltd RTO ID 91498, Maxis Solutions Pty Ltd RTO ID 91428, Insight Training Group Australia Pty Ltd RTO ID 32142 Precision Training Australia Pty Ltd RTO ID 91808 and Learning Lab Pty Ltd RTO ID 91341 (CRICOS 03576B). When would you like to start your course?